Where can I earn money by writing on the web? 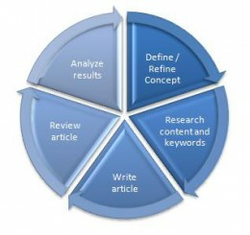 Article Writing is not easy but it can produce a nice residual income over time. Can you get rich by writing on the Web? You've all seen the 'Get Rich schemes' on the web and probably know a thousand ways to earn a million dollars or become a millionaire on the web; however for most of us this is simply a pipe dream. However, there are plenty of ways that decent writers can earn a nice residual income writing on the web. You are obviously reading this article on Wizzley. Wizzley is one of a crop of new article writing sites that are appearing on the web and it is definitely one of the more professional sites out there. It has a similar look and feel to Squidoo and Hubpages and overall it is very intuitive and fun. It's new, but has a solid foundation built from the skills of hardened article writers from Squidoo (and other article sites) – out of all of the new sites, Wizzley is probably the one that is more likely to succeed and prosper. Hubpages has been my writing site of choice for the last year or so and is my most successful in terms of traffic and revenue, including revenue from Amazon and eBay. It is a intuitive site but has been hard hit by the recent Google Pandemic; many top users left after the HP Staff seemed to flounder and become over protective. However, I am still there and will continue to be active as it still is a great site to write on. Squidoo is where I learned my trade. It is one of the better article sites, and has allowed me to earn a fairly decent stream of income over the years I've been a member. I find it harder to promote articles and get them ranked on Squidoo, but out of all the sites available it has the most options to build an 'amazing' looking article – probably better for hardened article writers who want to step into the world of creating truly multi-media articles. Excerptz is one of several new revenue sharing sites based around a Wordpress theme. Designed by a top writer from Hubpages it takes quality seriously and therefore has decent articles. It ranks very well with Google and is a pretty decent site to create back-links to your other articles – so far I've been very happy with the traffic and residual income. This is an interesting site from the creator of SheToldme.com; essentially you can create Top X lists – however for each entry in the list you can add content and a link – it's a great way to create back-links, but also seems to rank very well in Google – I've neglected this site, but am beginning to use it more and more as it provides a nice revenue stream. Webanswers isn't strictly an article site; it is simply a question and answer site. However, most Google Impressions go to those with high quality scores and thus the better the answers you provide the more likely you'll get a decent income stream. If you look at the top writers, they writer 300-400 word answers. It's a great site to build up a portfolio of answers, and then maintain perhaps 5 or 10 new answers a day – it creates a nice residual income stream and ranks well. It's taken me over 5 years to realize it, but blogs are a great resource for creating a following and earning some revenue. I have several blogs and while I only get 10 or 20 visits a day, I realize that if I promote my blog and be very active on other blogs then I could increase this and also get traffic through to my articles. It's great for providing back-links and if it is very well written and gets a decent following could earn a nice residual income by itself. Let me know if you want to share Blog links and have relevant content to match my blog. Good suggestions here, SimeyC! I'm trying to build up a personal blog, too, but slowly, slowly . . . I'm slowly building up my traffic on my personal blog! It's harder to do than getting traffic to a Hubpage or a Wizzley article, but I feel it's worth the effort - once I get up to a thousand views a day I can give up writing for other sites - probably take about 50 years though!!! Blogs are also given special preference in Google results, I hear. I find it hard to monetize my blogs, but I do love them anyway! Using the same word over and over again used to be a sure-fire way to get search engine hits. Now it will just get you fired. Squidoo was a popular self-publishing website a lot like this site, Wizzley; its rise and fall followed and reflected several common internet trends.